Hawaiian Slack Key music won back to back Grammy Awards for the Hawaiian music category in 2005, 2006 and 2007. This has elevated slack key to new levels of exposure and enjoyment. As a cultural icon in Hawaii it is tied generally to the guitar. 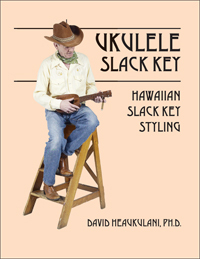 With this book David Heaukulani introduces this unique music style for `ukulele players who can now enjoy the same pleasure of Hawaiian slack key. “Uncle Dave” has incorporated technology as an improvement over earlier publications of slack key tutorials. He uses videos posted on the Internet to supplement the lessons and exercises. Slack key is fairly easy to learn and is made easier yet with pictures and video supplements. “Uncle Dave” has a degree in music and has been playing the `ukulele for fifty years. 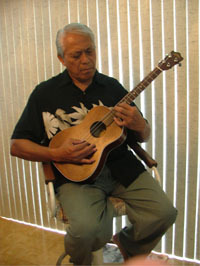 He has written many original `ukulele slack key songs, some of which are included in this publication. He teaches `ukulele slack key at the East Hawaii Cultural Center in Hilo, Hawaii and is also a lecturer at the University of Hawaii, Hilo campus. You are introduced to popular tunings: Taro Patch, Wahine F, Wahine G Major 7th, and Wahine D Major 7th. It does not matter if your standard tuning is GCEA for soprano, concert, or tenor or DGBE for baritone. The instructions take this into account to include all ‘ukulele scales. Traditional as well as original songs written for the ‘ukulele with tablature are included. David Heaukulani is a member of the American Society of Composers, Authors and Publishers (ASCAP). He has composed many original songs in Hawaiian slack key tuning, some of which are published in this book. He teaches 'ukulele slack key at the East Hawaii cultural center and builds custom 'ukulele instruments as well. You can visit his craftsmanship at www.ukulele-uncle.com.